Artists based in the Caldera Art Gallery, Murwillumbah Visitors Centre, are using their creative endeavours to encourage visitors and residents to explore the places that have inspired their work. Paintings and photographs depicting the caldera's magnificent landscapes and significant variety of wildlife are on show not only at the gallery itself but now also on a new website Caldera Wildscapes. "This website will be constantly evolving with new artworks/artists, videos, field-trip adventures, exhibitions, participation opportunities, blogs and a gift ideas store. We are most excited about the PhotoTrails initiative which feature interactive maps, images and descriptions of a number of self driving routes around the region," said Caldera Wildscapes founder, Andy Reimanis. The most recent PhotoTrail uploaded to the website is the River Flats Circuit. To date three have been completed, with another seven currently being researched and to be added during late 2016 and early 2017. Tweed Shire Council is currently producing a Scenic Landscape Strategy in order to identify the landscapes' scenic values and implement measures to manage and protect them, particularly in the context of vulnerability to development pressure. Council is inviting people to share their stories and photographs about scenic locations in the Tweed that are important to them. Go to What’s My Scene – Share you scenic landscape to upload images and stories to help develop the strategy. Tweed Shire's landscapes tell a rich and complex story of the region's evolution, its volcanic history, ecology, cultural and economic diversity. Those landscapes include the southern hemisphere’s largest extinct shield volcano, five World Heritage-listed National Parks containing ancient Gondwana rainforests and dramatic mountain ranges and 37km of white sandy beaches and rocky headlands. As part of the Tyalgum Music Festival’s Sunday Closing Gala, the Lunaire Collective will perform “Pictures at an Exhibition” by Russian composer Mussorgsky, in collaboration with Caldera Art. This world-famous piece of music depicts an imaginary tour of an art collection. Mussorgsky based his music on drawings and watercolours by Viktor Hartmann, an artist friend of his, produced during the painter's travels, and the individual movements have wonderfully evocative titles such as “The Great Gate of Kiev”, “The Old Castle” and “The Ballet of Chicks in their Shells”. Work is now complete to repair and reinstall a nesting platform for an Osprey breeding pair at Cudgen Creek, after the artificial cradle collapsed on 4 August during strong winds. Tweed Shire Council sourced an extra high cherry picker and crane to reattach the structure to a tower at Kingscliff. Council had been notified a few months previously that the pole holding the cradle was on a noticeable lean but was unable to undertake repairs at the time because the nest already contained Eastern Osprey eggs, which would have been endangered by any work. It will implement a program of inspection and maintenance of any ageing structures throughout the Tweed. Twenty years ago there were only 2 breeding pairs in the Tweed due to the absence of suitable naturally occurring nesting sites (tall dead trees with no foliage), but with the construction of artificial structures (an initiative of NSW National Parks & Wildlife Service, Essential Energy, and Tweed Bird Observers) there are now 22 known breeding sites in the Tweed, which include 21 constructed structures. A remarkably successful recovery program. Eastern Ospreys are still listed as Vulnerable in NSW and are being monitored by volunteers of Birdlife Northern Rivers who welcome new members to assist. The winners of the 2016 Waterhouse have been announced. This Natural Science Art Prize commemorates the birth of the South Australian Museum’s first curator, Frederick George Waterhouse. The biennial prize is an opportunity for artists to investigate the world around them, and present their perspectives on natural science. It encourages artists to make a statement about the scientific issues facing our planet, and offers a valuable platform for them to contribute to the environmental debate. Over the years the competition has become a much loved fixture on the arts calendar, allowing artists and audiences to explore natural science through a range of creative outlets. Jeff (Caldera Art Gallery resident artist - Mondays and Tuesdays) was appointed as guest judge for the recent Murwillumbah Rotary Art Prize 2016. With over 100 entries to consider, this popular community art exhibition left Jeff with ponderous decisions regarding prize selections. (cropped image below) being promptly purchased by the captain of the vessel. The recently launched 'Spirit' is the first riverboat since the 1930's to ferry passengers up the Tweed River to Murwillumbah. This traditional huon pine ferry is owned and operated by Mount Warning Tours. The Murwillumbah Visitors Centre and Caldera Art Gallery are housed within the building known as the World Heritage Rainforest Centre. Visitors to the centre can now appreciate the diversity of rainforest trees that were planted around the building during the 1980's and 90's with the publication of a brochure/map listing the species names and their locality. This project was an initiative of Caldera Wildscapes with voluntary input involving extensive research by Helen Manning and Andy Reimanis with assistance from Tweed Shire Council's NRM botanists Greg Newland, John Turnbull and Mike Healy. Greg Newland is also an accomplished zoological illustrator, specialising in marine creatures. 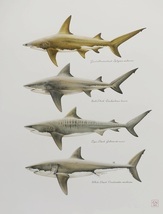 Being a regular entrant in Caldera Art exhibitions, the CAG printed a series of Art Cards depicting his remarkably detailed and accurate watercolours of shark and ray species found within our waters. 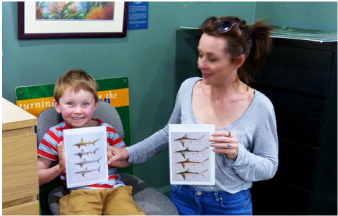 Recently, a young lad was 'taken' by Greg Newland's shark art cards on display in the Caldera Art Gallery. His mum purchased a couple of the cards for him, and he was absolutely CHUFFED as the image portrays! Onya Lauren and Van - who perhaps might become an icthyologist (google it) in a few years. Greg's response to this story..."priceless!" 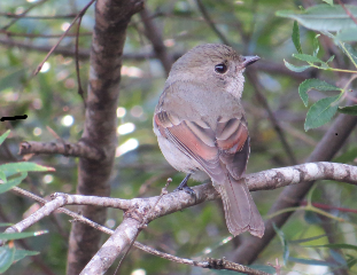 In order to help increase awareness of our native birds, readers are invited to forward a photo of a bird seen in their 'backyard' (or frontyard) along with an accompanying sentence or two describing 'what, why and where' (approximate locality) the photo was taken. We will upload on the CW website along with some interesting facts about the species. Additionally, Birdlife Australia has an excellent Birds in backyards website along with a useful bird identification page. "On guard duty at the front gate, sitting on my old plough sculpture......is he magnificent, or what"? said Simon. 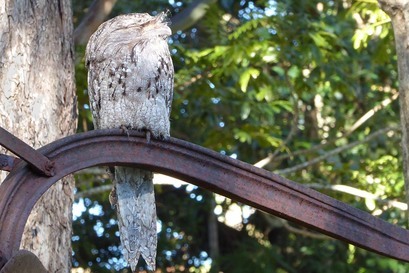 Although nocturnal, frogmouths are not related to owls but are more closely allied to ground dwelling nightjars. During the day they cryptically roost on tree branches with eyes closed and often necks outstretched. Sue from Myocum forwarded her photo of a 'mystery bird' (right) and described it as: "Smaller than a Noisy Miner, somewhat shorter bill and more sedate in feeding behaviour". We have have a fairly good idea of which species it is. ​Hint: immature birds are often more cryptically coloured than adult birds, especially the males. A fascinating part of exploring the rural roads of the Tweed region is discovering new viewing places of landforms we get used to seeing from our usual main driving routes. Within each CW e-news, a 'mystery' photo of an unusual view of a natural feature taken from the side of a public road, will be included. A prize is offered (a signed copy of the Tweed Book by editor Andy Reimanis) for the first reader correctly answering 3 questions: 1. Where is the general location of the landscape depicted. 2. What is the name of the highest peak. 3 From which public road was the photo taken.